I teach people the skills and knowledge they need in order to truly flourish in their lives. Individuals gain insight, perspective, and confidence so they can overcome any current or future obstacles and ultimately thrive in life. I work with individuals who generally come to me with a specific issue they want to address such as stress, anxiety, depression, OCD, fears or phobias. My youngest client to date was gorgeous 9 year old Molly. And equally as gorgeous was 71 year old Margaret. Both are now thriving their socks off after completing The Thrive Programme. I also work with organisations where I deliver The Thrive Programme in Business to groups, individuals, or through short, sharp but never dull speaking engagements. Everyone can learn the skills needed to consistently thrive in life. 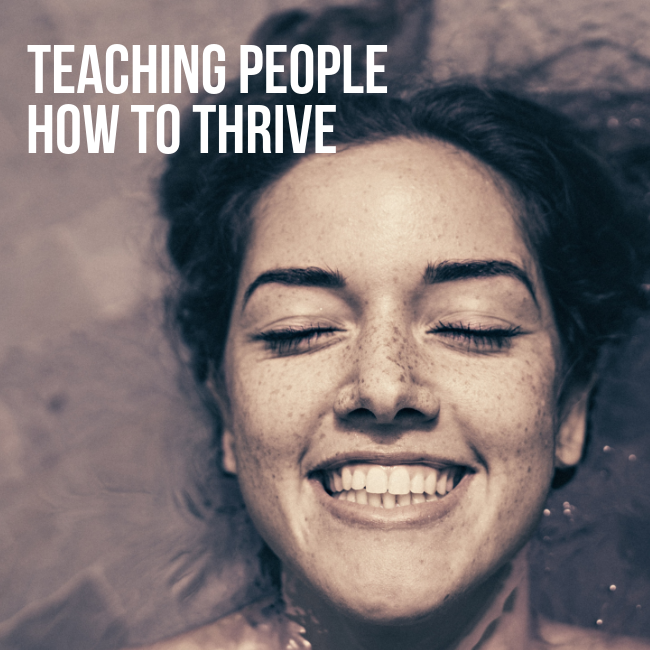 The Thrive Programme was developed, and continues to be updated, based upon the latest research studies into mental health, resilience and wellbeing. It's empowering as you gain insight into your psychological make-up. This knowledge inspires you to change as you understand exactly what you've got to do and why. I’m passionate about many things but particularly education and how it has the ability to change lives. I'm not just referring to formal education that leads to a job, but education that helps us learn and grow as people. I’ve always been interested in people. Why do some people always seem to be "up" with confidence and vitality, and others the opposite? Can we learn confidence? Can we change our personality? All of these questions sparked a growing interest in psychology and mental wellbeing. I started reading dozens of books on subjects such as cognitive psychology, positive psychology, sports psychology, memories, emotional intelligence, and many more. I became a Licensed Thrive Consultant after personally experiencing the success of the programme. Someone close to me suffered with emetophobia and after months of visiting a clinical psychologist, she was no better. We discovered The Thrive Programme and within six weeks she was on a plane travelling to the UK for a holiday. She was completely better. She's is now a healthy, happy, vibrant, and thriving young woman. In the process, I learnt about the history of The Thrive Programme and the solid scientific research behind it. When I’m not working, I enjoy the great outdoors. A bit of a cliche but nonetheless true. Our house is close by a lake with a trail all the way around. I walk or run around it often. It keeps my body and mind healthy. I live in Sydney with my husband. Most weekends are a mix of friends, family, cycling, running ... thriving. I’ve enjoyed 25+ years in large, global organisations with the majority of that time in General Management positions. I understand the pressures of business and the joy of achievement. I've had some wonderful learning opportunities during my career and I've been able to share a lot of this knowledge as a mentor and coach for >10 years. I made the decision to start Thought Ratio which is a blend of my experience and strengths, with what I find fascinating and important. And what's important to me is helping people to thrive so they can maximise this wonderful event called life.